China said Wednesday it had no plans to send military ships to Syria to fight with Russian forces after reports in overseas media indicated it was planning to do so. Chinese media has picked up Russian and Middle Eastern news reports that China would fight alongside Russia in Syria, and that China's sole aircraft carrier, the Liaoning, could participate too. Chinese media has also described these reports as speculative nonsense. Foreign Ministry spokeswoman Hua Chunying, when asked if China had or would send forces to Syria, told a daily news briefing that she had also noticed the reports. "I can tell you that as for China's warships, for example the Liaoning, whether it has gone to join, for this issue, as far as I know, there is no such plan. At this time the Liaoning is in a phase of carrying out technical training and military exercises." She did not elaborate. 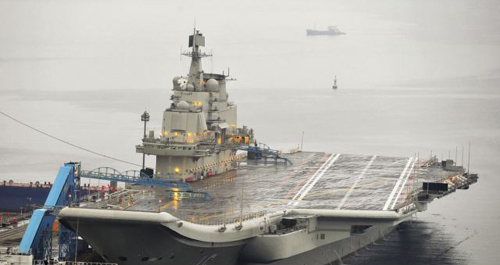 The Liaoning is generally considered by military experts to be a training carrier, while China builds its own carriers and works out how to operate them. China's Defense Ministry said it had nothing to add to Hua's comments. The Global Times, an influential tabloid run by the ruling Communist Party's official People's Daily, said in an editorial on Wednesday it was "unfounded rumor" that China would interfere militarily in Syria. "It's not China that brought chaos to Syria, and China has no reason to rush to the frontlines and play a confrontational role," it said.